Increased Herbicide Use: The widespread cultivation of GM herbicide-tolerant crops has pushed up the use of herbicides such as glyphosate. Herbicide sales in Canada rose by 130% between 1994 and 2011. “Superweeds”: The use of specific herbicides with GM herbicide-tolerant crops has led to the evolution and spread of “superweeds,” or weeds that can no longer be killed by those herbicides. In the past 20 years, 37 weed species have developed resistance to the herbicide glyphosate. “Superpests”: Some insects have also developed resistance to the toxins in GM insect-resistant crops. Contamination: Contamination from GM plants is has serious ecological, economic and social impacts. Gene flow from GM crops poses a threat to wild and weedy crop relatives, non-GM crops and foods, and organic farming. Decrease in Biodiversity: GM crops can have impacts on non-target organisms and on soil and water ecosystems. The expansion of GM herbicide-tolerant corn and soy, which are twinned with herbicides, has destroyed much of the habitat of the monarch butterfly in North America. Almost all the GM crops grown in Canada – corn, soy, canola and sugar beet – are engineered to be tolerant to a specific herbicide. The spread of such herbicide-tolerant crops have pushed up the use of herbicides such as glyphosate. Between 1994 and 2011, herbicide sales in Canada have increased by 130%. Glyphosate is the top pesticide ingredient sold in Canada, and its use tripled between 2005 and 2011. Data from the US and Latin America also shows that GM herbicide tolerant crops have increased herbicide use. In the US, scientist Charles Benbrook found that total pesticide use was 24% higher for GM crops than it was for non-GM crops by 2011. Below is a summary of the presentation “Implications of GM crop cultivation at large spatial scales“, by Charles Benbrook, By PhD, Center for Sustaining Agriculture and Natural Resources, Washington State University, Pullman, WA. Presentation given in Bremen, Germany, June 14-15, 2012. The following is based on U.S. Department of Agriculture data. HT soybeans account for 72% of the total increase in herbicide use across the three HT crops. 0.86 pounds per acre more in cotton. Use of glyphosate on GM RR soy acres INCREASED from 0.69 pounds per acre in 1996 to 1.56 in 2011. Use of other herbicides on GM RR soy acres DECREASED from 0.20 pounds per acre in 1996 to 0.12 in 2011. Use of all herbicides on GM RR soy acres INCREASED from 0.89 pounds per acre in 1996 to 1.68 in 2011. Use of all herbicides on non-GM soy acres DECREASED from 1.19 pounds per acre in 1996 to 0.96 in 2011. The differential between herbicides used on GM RR soy and non-GM soy is growing, showing that GM RR soy is increasing the use of herbicides over time whereas non-GM soy is decreasing herbicide use. In 1996 GM RR soy needed 0.30 pounds per acre less herbicide than non-GM soy. But in 2011 GM RR soy needed 0.73 pounds per acre more herbicide than non-GM soy. Soy: increase of 96.6% between 1996 and 2006. The new data is an update of Benbrook’s previous reports of 2004 and 2009. The 2009 report found that herbicide use had increased 383 million pounds (173 million kgs) in first 13 years of GM crop use, due to herbicide-tolerant crops. A modest reduction in chemical insecticide spray applications due to Bt crops (down 64.2 million pounds or 29.1 million kg) was swamped by an overall increase in pesticide use of 318 million pounds (144 million kg). A similar pattern of increased herbicide use can also be seen in South America, where a large amount of GM soybean is being grown. In Argentina, glyphosate use increased from 20-26 million litres per year in 1996-1999, to over 101 million litres by 2000. By 2013, glyphosate use in Argentina was estimated to be 200 million litres. In Brazil, the total volume of all pesticides sold rose by 360% between 2000 and 2009. Herbicide use increased by 43% between 2006 and 2012, as the area planted with GM crops tripled. Soybean fields are the largest users of pesticides, and approximately 93% of Brazil’s soybean hectares are cultivated with GM varieties. In 2012, Brazil surpassed the United States as the largest global buyer of pesticides. In Uruguay, as the area planted with herbicide-tolerant soybean steadily increased from 1999 to 2010, the use of glyphosate also climbed, from 1.22 million kilograms in 1998, to 12.29 million kilograms by 2010. In Bolivia, glyphosate use increased from 3.18 million litres in 2004 to 11.19 million litres in 2008. The report “Soybean production in the Southern Come of the Americas: Update on Land and Pesticides Use” compiles and analyzes specific data on land and pesticide use in the main soybean producing countries of the Southern Cone of South America: Argentina, Bolivia, Brazil, Paraguay, and Uruguay. GM insect-resistant (Bt) crops are engineered to produce a toxin that makes the entire plant toxic to some insects, such as butterflies and beetles. In the US, Bt crops decreased the use of insecticides by 124 million pounds between 1996 and 2011. However, the toxin produced by the plant may also have adverse environmental impacts. Bt crops simply change the way that pesticides are used, from sprayed on, to built in. Overall, GM crops in the US have increased pesticide use by 403 million pounds (183 million kgs). One of the consequences of the increased use of specific herbicides with GM herbicide-tolerant crops has been the emergence and spread of herbicide-resistant (HR) weeds, or “superweeds”. These are weeds that develop resistance to certain herbicides when they are widely and frequently applied. The emergence of herbicide-resistant weeds predates GM crops. The first instances of herbicide-resistant weeds were observed in the 1950s with the introduction and wider use of industrial farming methods and chemical herbicides. As herbicide-use has increased, so has the number and range of herbicide-resistant weeds. GM crops have accelerated and entrenched this pattern because the introduction of herbicide-tolerant crops, particularly glyphosate-tolerant “Roundup Ready” crops, has meant that large areas of cropland are repeatedly sprayed with the same herbicide. There are currently 37 species of weeds that are tolerant to glyphosate around the world. Five of these species are found in Canada. In the US, the USDA estimated that 28.3 million hectares of US farmland were infested with glyphosate- resistant weeds in 2013. Herbicide resistant weeds also present economic costs for farmers. In the US, weed management costs in infested fields is 50-100% higher per hectare than in those without glyphosate-resistant weeds. Some weeds have developed resistance to multiple herbicides, making them even harder to control. The spread of HR weeds in turn drives up herbicide use, leading to a “pesticide treadmill” that has serious impacts on the environmental and human health. Once genetically modified organisms are released into the environment, they are difficult or impossible to recall or control. GM contamination can occur through any number of ways, including through human error. Over the past twenty years in Canada, there have been many cases where genetic material from GM crops has mixed with non-GM crops and foods. Canadian farmers are currently suffering through a crisis of GM contamination of flax. The recent introduction of the first GM perennial crop, GM alfalfa, poses a particularly serious contamination threat that will impact conventional and organic farmers. Communities around the world are working to stop and reverse GM contamination. “Fighting GMO contamination around the world, 2009. There is a Worldwide Contamination Registry of GM contamination incidents that documents the details of all the known cases of GM contamination of food, feed, seed and wild plants. Hosted by GeneWatch UK and Greenpeace. The Register has documented more than 216 cases of GM contamination in 57 countries over the past 10 years, including 39 cases in 2007. Herbicide-tolerant crop systems have encouraged the use of herbicides that reduce overall plant diversity in agricultural systems and can limit habitat and food sources for other important organisms. Monarch butterfly populations have declined by more than 90% in under 20 years. It is estimated that the butterflies may have lost more than 165 million acres of habitat in this time-frame largely due to the increase in the use of the herbicide glyphosate, which kills the common milkweed that the butterfly needs to breed. Click here for detailed information from the Centre for Food Safety US. Pollen and other plant parts containing toxins from genetically engineered insect-resistant (Bt) corn are washing into streams near cornfields. Lab trials showed that consumption of Bt corn byproducts produces increased mortality and reduced growth in caddisflies, aquatic insects that are related to the pests targeted by the toxin in Bt corn. Are GM Crops Better for the Environment? 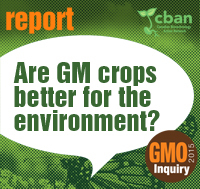 GMO Inquiry report, May 2015, CBAN.